FLEX is a new standalone vehicle sensor from Sensebit with integrated battery and modem that requires no roadside installation. It is installed in the middle of the lane to be measured and is managed remotely. An installation takes about 15 minutes and it allows the user to schedule more than 365 days of accurate data collection during a ten-year period, which makes it ideal for measuring AADT, seasonal variations, effect studies and much more. Collecting traffic data has traditionally meant a compromise between the number of days to be measured, the accuracy of the data and cost. For short measurement periods, pneumatic tubes, radar or manual counting has been used. But, for longer measurement periods, the cost has increased dramatically due to the need of roadside installations with power and communication for the measurement equipment. Unfortunately, this compromise often means that municipalities and cities almost exclusively use short periods of annual measurements for most roads, which in turn gives unreliable readings of the traffic and its development. 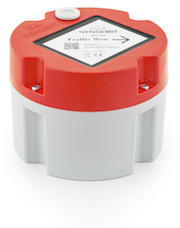 To address this problem, the development team at Sensebit has worked together with our partners and customers around the globe to develop a product that allows for longer periods of collection without the need for expensive roadside installations. The result is the new FLEX vehicle sensor with ultra low power consumption. The low power consumption gives the user more than 365 days of accurate data collection that can be scheduled during a ten-year-period which means it can be used for a wide variety of scenarios. Many municipalities and cities measure a majority of their roads once every year. The length of the measurement period is typically one week up to a month. This measurement schedule gives an indication of the annual traffic and its development. However, in many cases the seasonal bias will make data far from ideal when looking at the overall annual traffic. By installing the FLEX vehicle sensor, each location can be measured one month in the summer and one in the winter for six years. If even less season bias is desired, one week every month can be measured for four years. All this is done with only one visit to the location, the rest is done from the office. When the total annual traffic is desired, the only option until now has been a permanent measurement station with costly roadside installations. With the FLEX vehicle sensor, the same data can be obtained at a much lower cost, and with only 15 minutes of traffic shutdown in each lane during installation. Read more about the FLEX vehicle sensor here or contact sales@sensebit.se to try the new FLEX vehicle sensor and see what it can do for you!